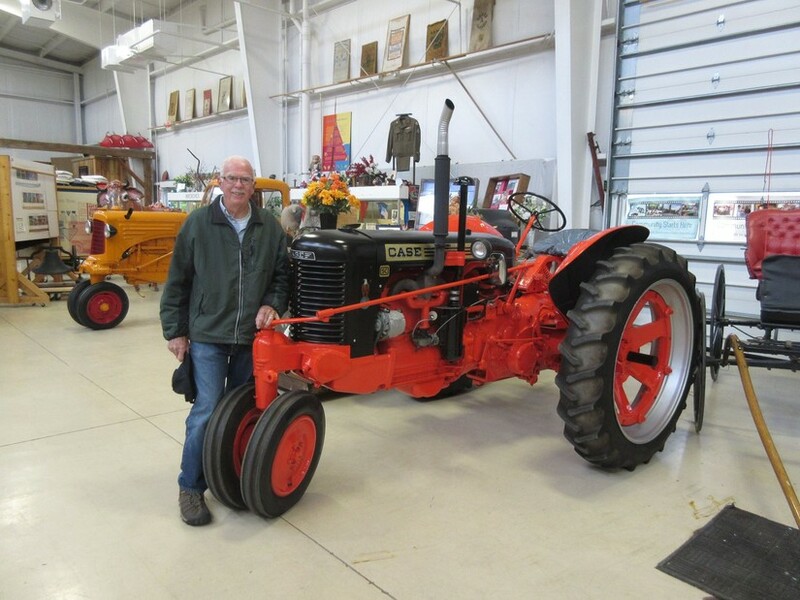 Nelson Hansen, of Hudsonville, donated this beautiful 1954 CASE SC to the Museum! In Memory of Peter Boon, Jr. The Eclipse Windmill was Invented by the Rev. Leonard H. Wheeler in 1867. L.H. Wheeler and Co. produced the windmills until the early 1870s when Wheeler joined others to form the Eclipse Wind Mill Company in Beloit, Wisconsin, which later became the Eclipse Wind Engine Co. and by 1894 was succeeded by Fairbanks, Morse & Co. of Chicago. Fairbanks, Morse, and Co. continued selling the Eclipse until about 1923, after which time the company discontinued its entire line of wooden-wheel Eclipse mills in favor of its steel windmills. In 1870 Wheeler and Co. installed its first large diameter windmill for the purpose of pumping boiler water for railway steam locomotives. Wind engine towers were built from 10’ - 80’ tall with water tanks from 1,000 to 3,500 gallon capacities. Wind engines were an inexpensive source of power for a variety of tasks for farmers and ranchers. They not only pumped water, but cut fodder, shelled corn, ground grain, and cut wood. When Wheeler’s patent expired in 1901 and the rights to the Eclipse mills entered public domain, a number of companies began producing them so closely that the parts were interchangeable. Pete & Nancy Boon purchased this vintage windmill in Clovis, New Mexico. The Boon Family transported it to Michigan in their camper. 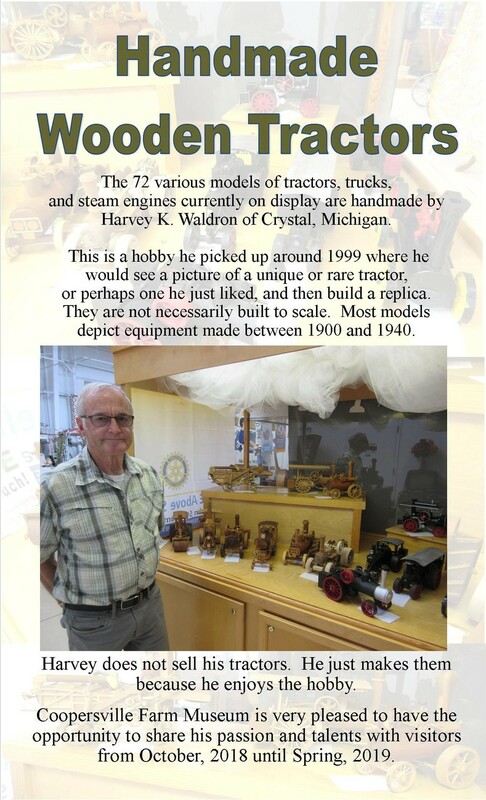 Pete built the wooden tower and placed it in their yard in Grand Haven. There is stood for many years. 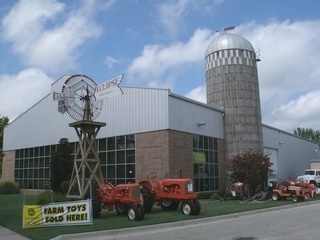 In 2009, Nancy Boon offered the windmill and tower to the Coopersville Farm Museum in memory of her husband, Pete. With the help of family and friends of the Boon family, volunteers from the Farm Museum, and West Shore Services the windmill was carefully transported from Grand Haven to Coopersville. The tower was put in place on the south side of the museum and the head, feather & fin were brought inside to be restored over the winter. Volunteer, Jack Fisher, made this project his personal challenge. He reconstructed many of the wooden slats and pieces and spent hours repainting the entire thing in the same patriotic manner it was received. The Eclipse Windmill that stands on Main Street, was donated to the Coopersville Farm Museum by the Boon Family of Grand Haven, Michigan, in 2009.